Look, if there's anything their cookie-selling-prowess has taught us, it's that the Girl Scouts will survive. It's khaki wishes and cookie dreams. Be it Armageddon or an international ban on the color forest green, those young scouting ladies will persevere. The only thing that will change is their badges. So, what sort of award updates will be necessary in a cyberpunk dystopia? Whether an enterprising scout must bring down an artificial intelligence created by a wealthy, crazy family full of clones or help develop an extremely interactive primer to educate other young ladies, a Girl Scout must be intimately familiar with the ins and outs of artificial intelligences. Times will be tough in a cyberpunk dystopia. Resources will be scarce, especially fresh protein. This, dear reader, is when vat grown and cloned meat (like Dolly of the previous century) will be in demand. Our Mendelian prodigies will not only know how to grow peas out of trash, but will be able to set up a fully functioning cloning lab out of found materials after earning their badge. Finally, should all else fail, a good Girl Scout should know what to do in case of a societal collapse. If housing becomes unavailable or the government no longer has control of over prized landmarks, a scout should be adept at setting up a household in both rural and urban settings even if the only real estate available is on the lower deck of the Bay Bridge. Heed my warning, dear reader. Make new friends in a cyberpunk dystopia. These girls may be your only hope of surviving. * Megan S. is a former Girl Scout and is still very proud of her ability to handle any emergency situation from tangling with the Yakuza to a complete dearth of Thin Mints. **That's the word "binary" in binary for you n00bs. ***I, for one, welcome our AI overlords. The badge images are great and a nice addition to TTs. I hope we see more from you. ...or a floating nation state whose people speak in tongues? I better get my coding up to snuff. We only had to fight zombies when I was a scout. ...even if the only real estate available is on the lower deck of the Bay Bridge. But wouldn't a good girl scout know that the last big quake made a section drop out of that bridge? Wouldn't the top deck be safer? Thanks, JA! I know it's a lot different from most of the contributions in that it isn't an actual story so I felt unsure about putting it up. The Bay Bridge joke is a reference to William Gibson's All Tomorrow's Parties. I asked him where he got the idea to populate the bridge at a book signing last year. He answered that early one morning, he looked out his window from his hotel room tens of stories up from the ground floor in downtown San Francisco and only saw the very tops of the bridge visible above the clouds. He thought it looked like a great little place for someone to live. Really enjoyable post (and the franchise potential is palpable). I'm a former Boy Scout myself, but I have much more confidence in Girl Scout survival. I love the layout of everything and could totally see this in a pamphlet or handbook. 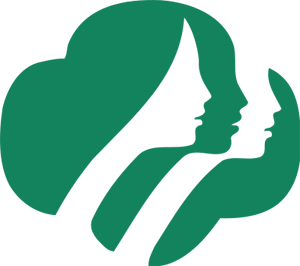 Mrs. O spent years in the Girl Scouts in her youth. In that paramilitary organization she rose to the exalted rank of camp counsellor and Red Cross certified life guard and instructor. As she has frequently pointed out, the original Girl Scout handbook says every girl should know how to swim, ride a horse, and shoot a gun. I know she can ride a horse, I've seen her swim, and I can personally attest to her proficiency with a 9mm Glock and a twelve-gauge pump shotgun. Well done, Mrs. O. Roving bands of feral Girl Scouts will rule in the coming post-apocalyptic world.